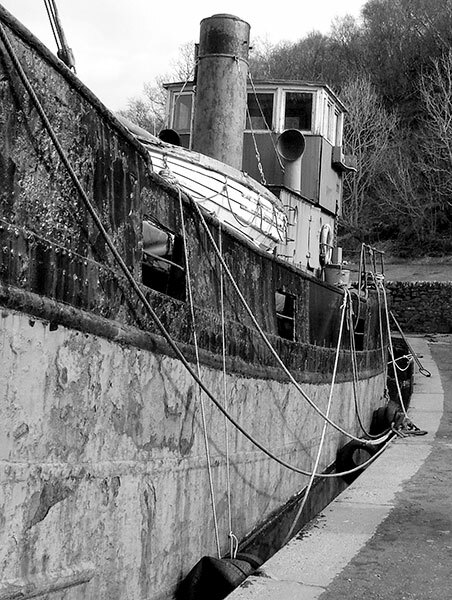 These photographs were made in 2005 at the western end of the Crinan Canal. Designed by John Rennie and begun in 1794 it was cut across the narrow northern neck of the Mull of Kintyre to provide a short cut for shipping between the Firth of Clyde and the Western Isles. Opened to shipping in 1801 it was improved and completed by Thomas Telford c.1816: it's now used largely by leisure craft. The diminutive Crinan Lighthouse was built at the end of the nineteenth century. 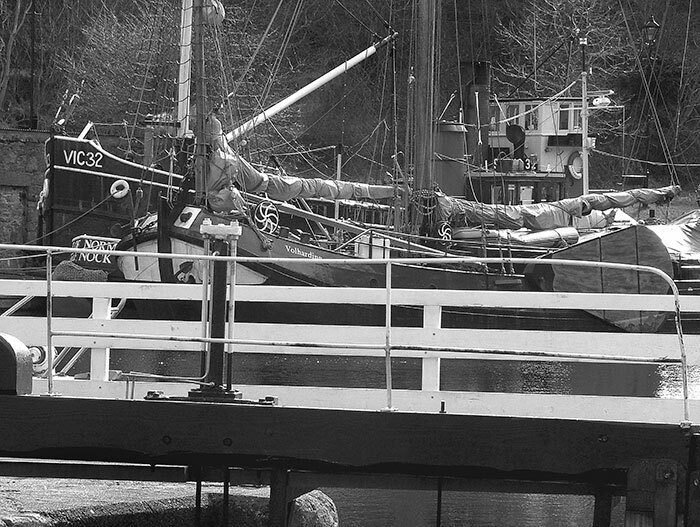 The nine miles of waterway is crossed by one retractable and six swing bridges between Crinan on the Sound of Jura and the eastern entrance at Ardrishaig on Loch Gilp. Water to operate the locks is supplied by reservoirs in the higher central section. A yacht marina occupies a large basin at Bellanoch close to Crinan. The deep inner gates of Lock 15 separate the fresh water of the canal from the salt water of the Sound of Jura. I hope that I may eventually walk the Canal's full length to photograph some of its structure, engineering and architecture. The trim stone and white houses, colourful gardens and the sometimes wild landscapes are a fine environment for passage on foot or boat. 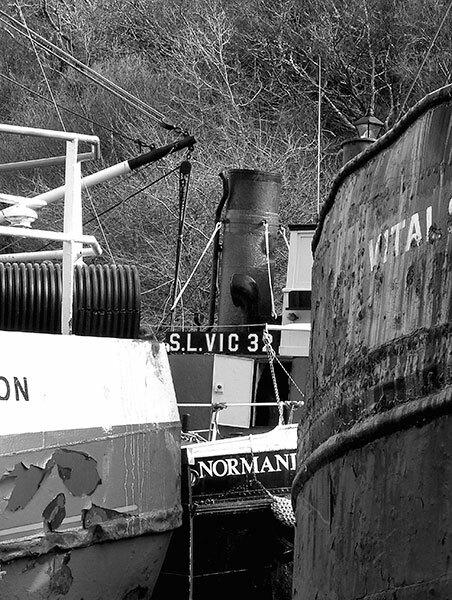 A glimpse of VIC32 and the Duke of Normandy viewed between an unrecorded fishing boat and the Vital Spark. 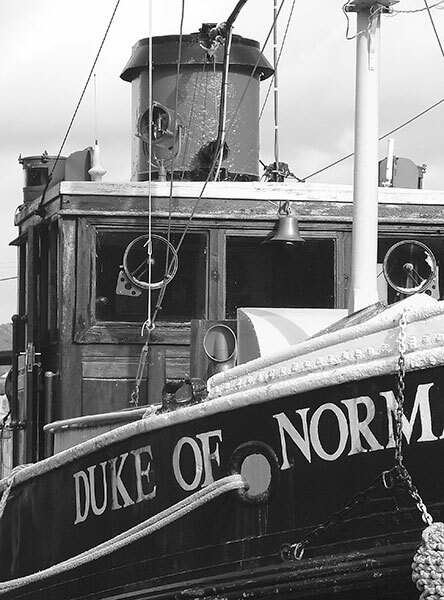 Fenders, both specialised and improvised, separate the Volharding from the Duke of Normandy II. The first steam powered Clyde Puffer was built in 1856 for use on Scottish canals. 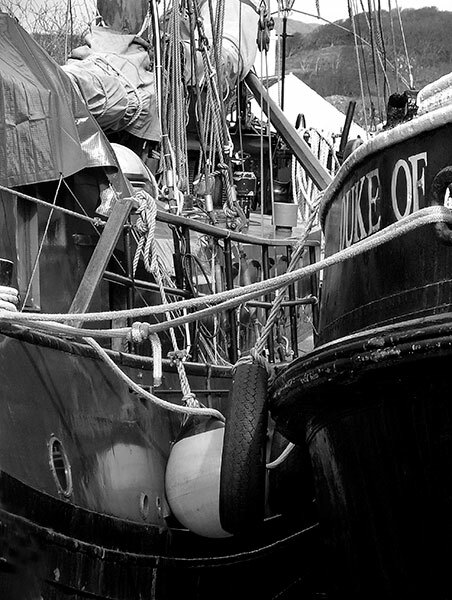 Developed and enlarged designs allowed use at sea in the coastal trade. 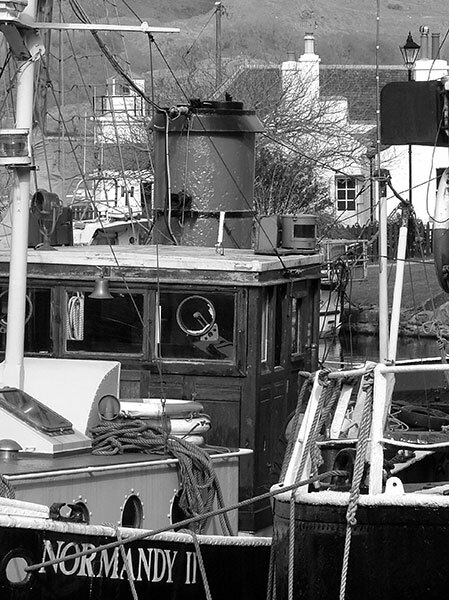 Over almost a century some 400 were built in UK shipyards of which a few survive in use or on static display. Their capacious flat-bottomed hulls allowed them to be beached between tides to be worked independently of piers. The nickname originated from the sight and sound of the original non-condensing engine discharging steam through the funnel with the smoke from the boiler as in railway locomotive practice. The compact hull and bluff bow provides a capacious box-shaped hold in the broad centre to store cargo handled by the mast-mounted derrick. In VIC 32 that space is now occupied by two decks of cabins and communal facilities for the passengers it first carried in 1979. The row of small rectangular windows on the raised hatch side hints at the change of function. 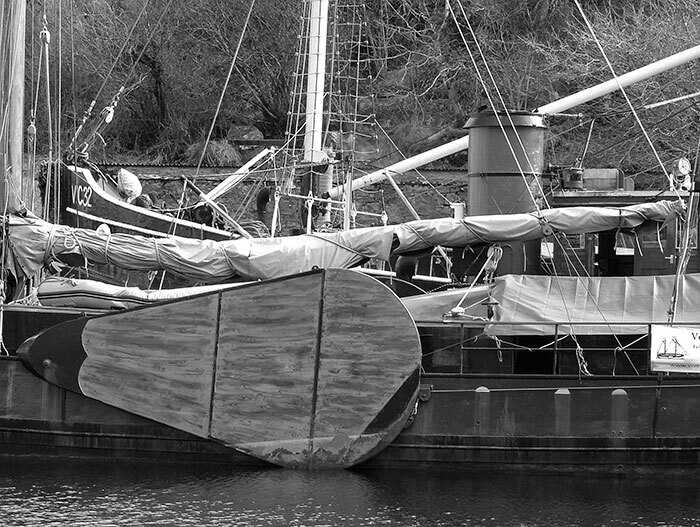 The tarpaulin cover would have completed the weather protection in the boat's freighter days. 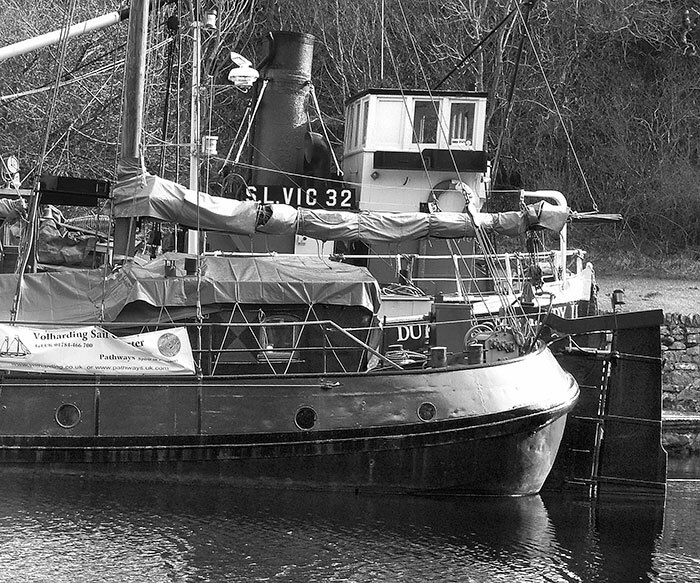 Commissioned into the Royal Navy in 1943 and classed as a Victualling Inshore Craft, VIC32 was one of around 100 built almost entirely in England for wartime service. Post-1945 these became 'surplus to requirements' and sold into civilian use or simply scrapped. 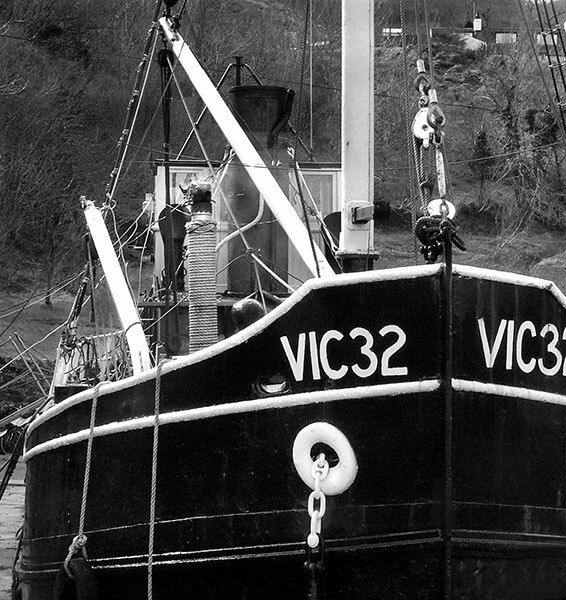 VIC32's biography and current sailing schedules are detailed on the 'Save the Puffer' website. The early non-condensing coal-fired vertical boilers were succeeded by condensing types whilst some of the military craft were equipped to burn oil as an alternative fuel or fitted with diesel engines. The bridge wheelhouse sits above a small stern cabin behind the engine room and boiler funnel, a layout that maximises the cargo space. Visibility from the bridge must have been compromised. Built in Germany in 1934 for Customs service, the vessel was based in Jersey during the German military occupation of the island in the Second World War. Retained by the Jersey authorities after 1945 it was eventually sold into a succession of private owners. 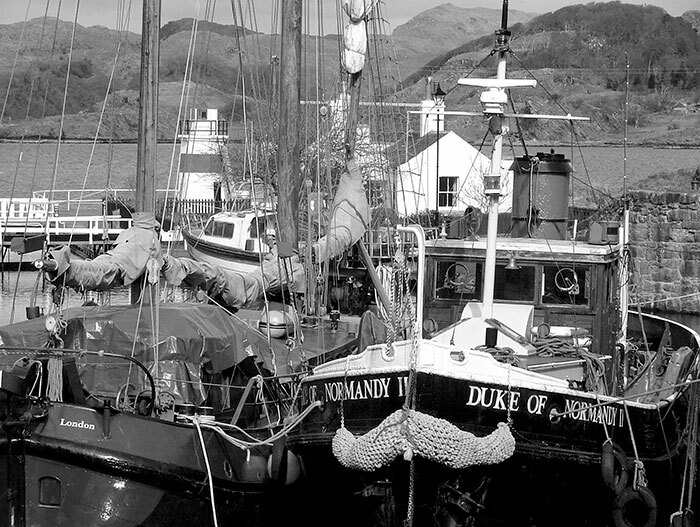 It was in Crinan basin when I briefly visited in 2012 and may still be based there. A view framed to include both bridge and foredeck cabin. A perspective view enclosing fragments of bow, bridge and funnel. 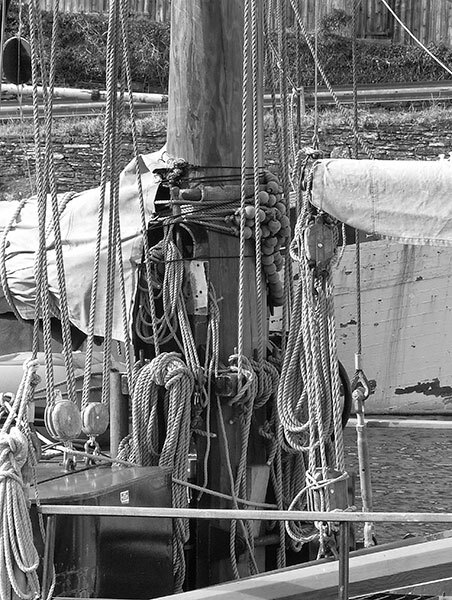 Rope working across a wide range of functions and complexity was an essential manual skill in the days of sailing ships. Although the demand for them is much reduced many of those practical arts are still followed in yet another century. This ageing fender in fading blue synthetic rope is a good example of intricate knotting both practical and decorative. The images in the two TALL SHIPS galleries record rope in great abundance. 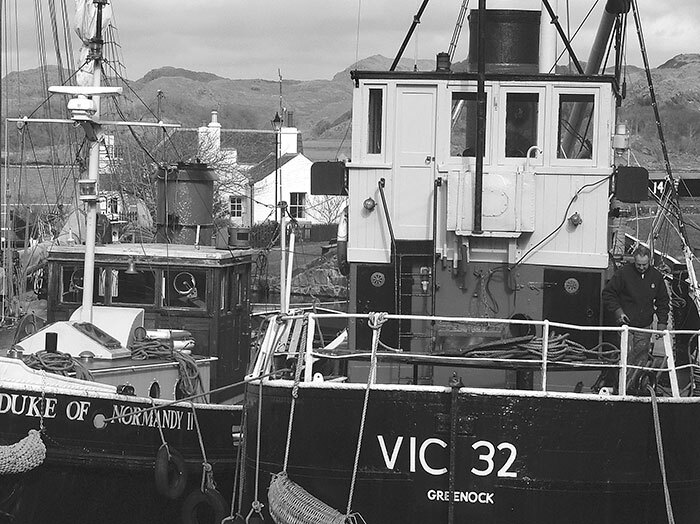 Launched in 1943, VIC27 carried military supplies around the Scottish coast. 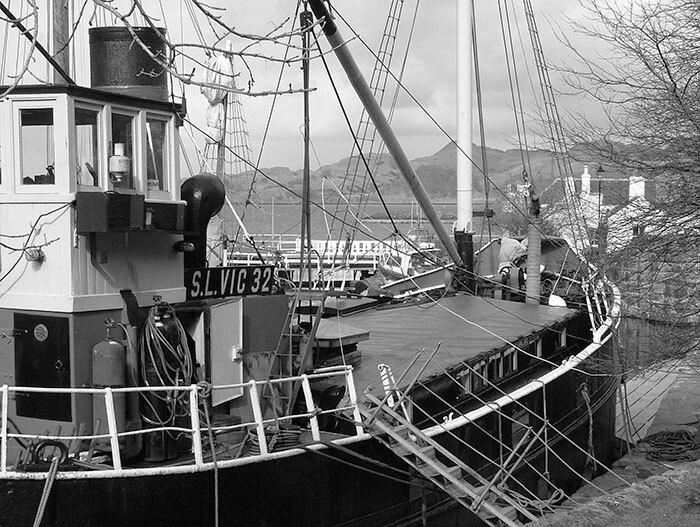 After 1945 she became the civilian 'Auld Reekie' and began a new life as a training ship for young people. Re-named 'Vital Spark', she starred in the 1990s BBC Television series based on Neil Munro's nautical short stories, 'Tales of Para Handy'. 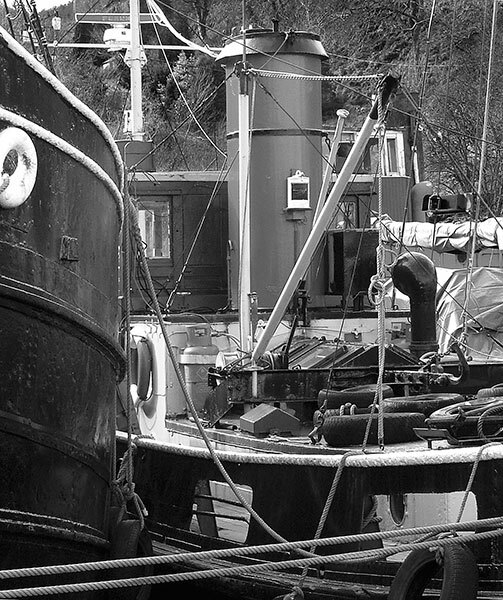 By 2005 time and corrosion had taken their toll but in 2013 she was sitting on the slipway of the nearby Crinan Boatyard undergoing an extensive refit and restoration: details of this are on the VIC27 website. This large lee-board is fitted to the port side of the 'Volharding', an eighty foot sea-going ketch-rigged sailing barge built in Holland in 1890. The hulls of such craft are flat bottomed and the boards fitted both port and starboard serve the same purpose as a central fixed keel. 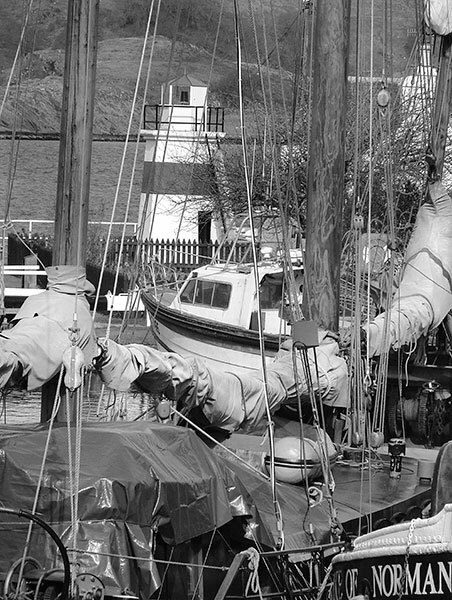 Fully restored, information on its construction and the sailing programmes it undertakes can be located by searching its name online. 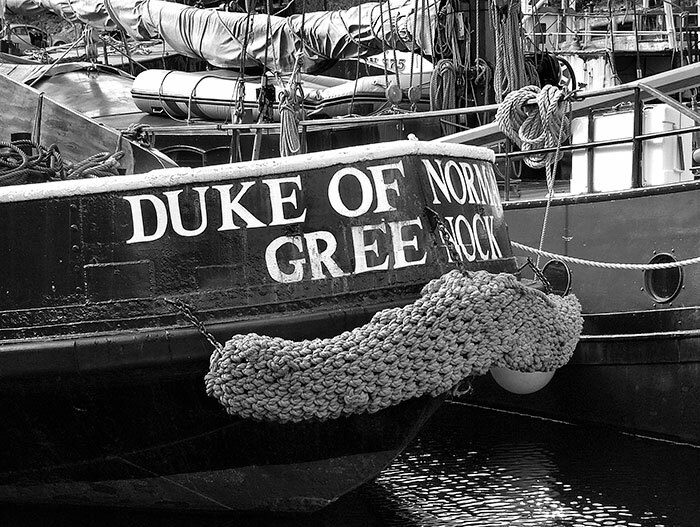 The Duke of Normandy II and VIC32 lie beyond. 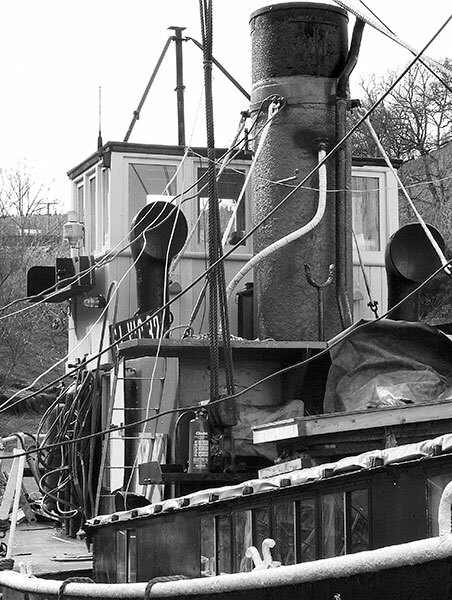 The sternpost and rudder combine as a prominent feature on the stern of the Volharding. A composition framing equipment details on the starboard bow of the 'Volharding'. 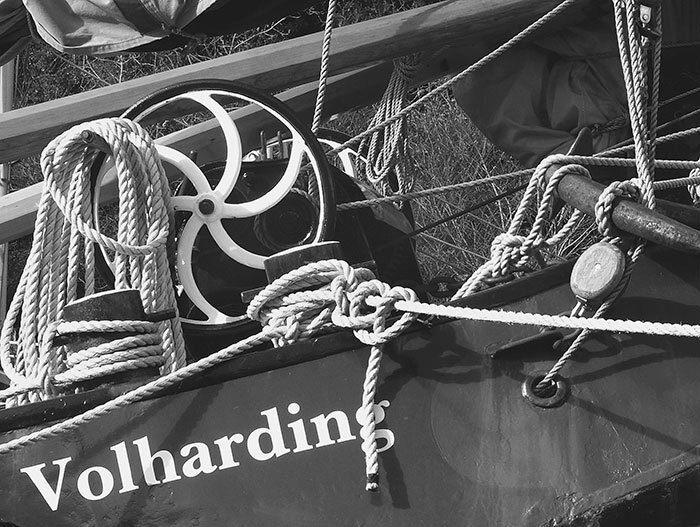 Intricate sail control gear is fitted around the base of the Volharding's mainmast.